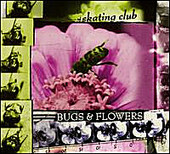 Bugs & Flowers, the sophomore album from Skating Club, the band masterminded by studio engineer/drummer/vocalist Aubrey Anderson, is an indie-pop delight. It is the kind of record that isn't afraid to rock out and step on some toes, but also knows its place and reverts back to more subtle, melody-laden structures over jarring, noisy, or loose-fitting and free-flowing. The tight compositions show that Anderson is comfortable in the studio (as he should be, he is an engineer), as well as the fact that his band is comfortable backing up his songs. The songs hover between slumber-y and rocking, finding solid ground between the two and thriving well there. I'll give this a B-.